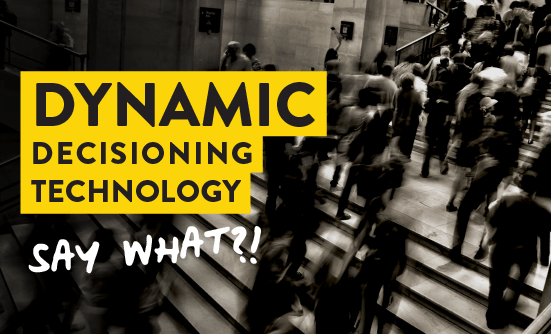 Digital Alchemy | Dynamic Decisioning Technology, Say What?! Digitalisation has significantly increased the pace of change and forced companies to transform the way they meet the ever evolving needs of their customers. In today’s rapidly evolving world, standing still is no longer an option, as failing to keep up has a serious risk of following the outdated marketing dinosaurs into extinction. Last time we checked no one wanted to be the next Kodak…but how to be the next ‘purple cow’ of digital? It’s safe to say that describing the marketing industry as dynamic would be an understatement, same as the customers it’s trying to engage. After all, customers are real human beings, whose needs and wants change over time. You know the story of boy meets girl, they fall madly in love, get married, and buy lots of stuff together…? Just like in the good old days of physical interactions, customers expect to be known at every interaction with a company. It goes without saying that this goes beyond blasting out the same marketing communications to your entire database with only changing %%firstname%% – relevance over reach, value over volume. Yet, figuring out what makes your customers tick by looking at all your available data might feel a little overwhelming. There is a bit of comfort in knowing that it’s not about how much data you’ve available, it’s what you do with the data you’ve that counts. Recently, Forbes Magazine published 2017’s list of most valuable companies in the world. Guess what? The most valuable companies on there are really good in making use of their customer data. From Apple to Amazon and Facebook to Google, they use their everyday customer data to talk to customers in the way customers want to be spoken to. The remarkable thing about these companies is that they’ve figured out how to let technology do a big chunk of the work for them by using artificial intelligence (AI) such as machine learning to extract more value from data. AI helps them make the right decisions about who to talk to, what to say, as well as where and when to talk to customers in order to engage them across all touch points. This allows them to focus on what’s most important in the first place – engaging and inspiring customers. This is what we at Digital Alchemy call ‘Dynamic Decisioning’, where technology like uDecide®, with its machine learning algorithm, automates the decision making process that goes into marketing. Case in point, uDecide® has the ability to constantly learn what content, campaigns, offers, or channels, a customer is engaging with, and conversely not engaging with then uses these insights to make decisions in real time. Simply put, dynamic decisioning technology uses customer data to determine in real time what to do next, taking all available information you’ve about each customer into account, so you can look at the customer journey as a whole rather than in isolation. One could argue that the world’s most valuable resource at this point is no longer oil, but data. Let’s use it wisely to stay relevant and ahead of the curve with the goal to benefit our customers, so we can become oil gurus of data.